Disney’s latest Musical Frozen has opened for previews on Broadway in New York City. This newest adaption really brings the story to life like we’ve never seen before. Telling the tale of two sisters, Caissey Levi lands the role of Queen Elsa and Patti Murin as Anna. When you walk into the St. James’s Theatre, you’re not in New York anymore but the city of Arendelle. I was lucky on my recent trip to New York and managed to get tickets to this incredible production. The sets were beautiful and ingenious. The special effects like Elsa’s ice powers were out of this world, with the use of clever projections and Snow. You felt like you were in a real life snow storm. What about Olaf and Sven? Don’t worry, your favourite sidekicks are there and they are more real than ever. Hans (Josh Riddle) and Kristoff (Jelani Alladin) also appear in this wonderful production. Young Anna and Elsa are adorable and very confident in their roles. The curtain backdrop was the Northern Lights and, the Northern Lights appear throughout which make it very magical. One scene includes a bridge made of “ice” that was really unique. The actors really capture our beloved characters but also, give them more depth as we learn more about each characters story. We learn why Anna wants true love, and how Elsa is scared of her powers creating her a Monster. You also get to hear a bit more about Kristoff’s story and Hans’s in Hans of the Southern Isles. The Trolls in the show are completely different to how we’ve seen them on screen. It is a very innovative way and I wasn’t sure at first with this new direction but, they were done so beautifully. The Hidden Folk as they’re called are pictured quite scary at first but are a bewitching new take on Kristoff’s family. Olaf and Sven so are convincing, you start to think that there’s a real life Reindeer on stage. Olaf played by Greg Hildreth does a brilliant performance as our favourite Snowman, using unbelievable puppetry and singing everyones favourite In Summer. The costumes were incredible. 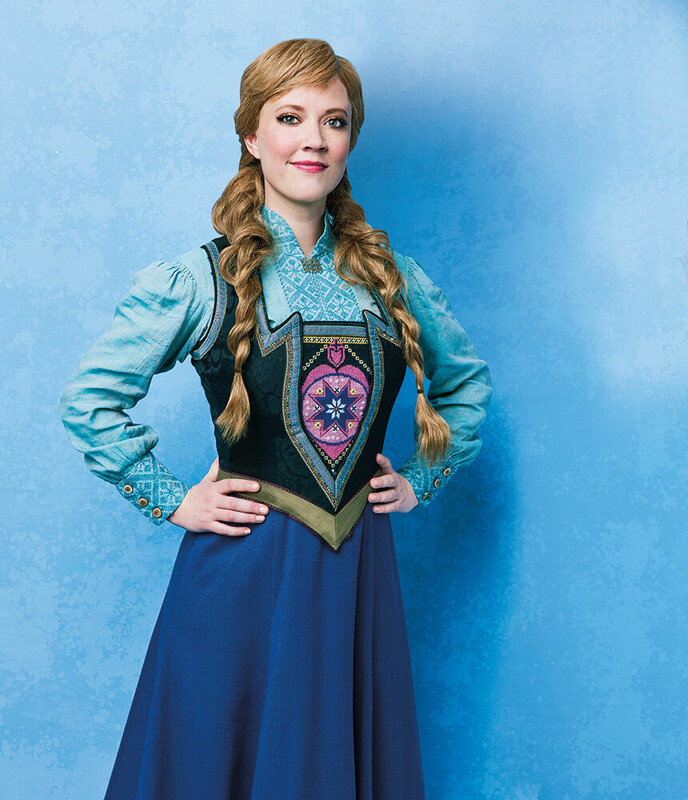 Elsa’s ice dress has a different look in Act 2 and Anna is given a snow suit just like Kristoff’s. The ensemble wears beautiful Victorian dresses which really makes scenes like Elsa’s Coronation breathtaking. New songs have been especially created for Frozen on Broadway which are currently being released each week on Spotify and iTunes. I waited until I saw it live to hear these songs and, I’m glad I did as it makes them more intense. The show also includes favourites such as the hit Let It Go and Do You Want To Build A Snowman?! These new songs fit perfectly into the story and, I was so excited to hear them live. I was not disappointed. 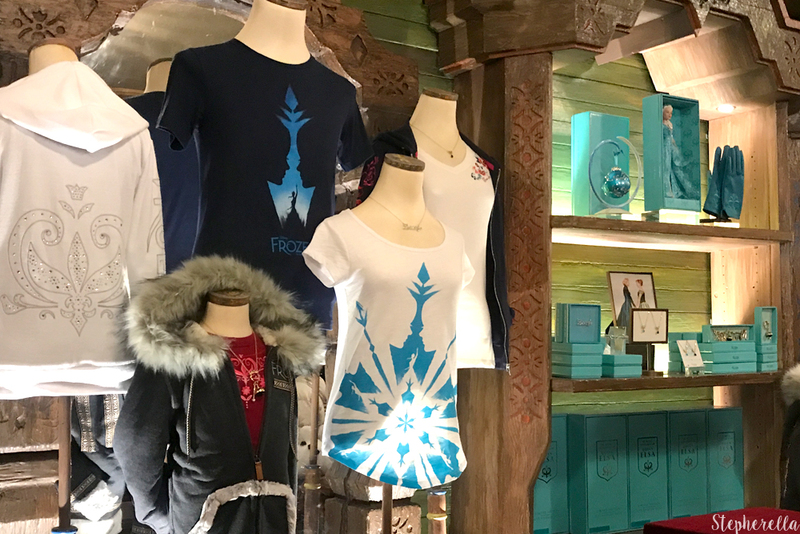 As we know there are lots of merchandise already available for Disney’s Frozen. I wasn’t expecting anything different to what we’ve already seen in the shops but, there were some very unique items which was a nice surprise. When you purchase an item, you get given a menu in the queue to look at whats available to buy. This is a sufficient way and makes queuing much quicker. 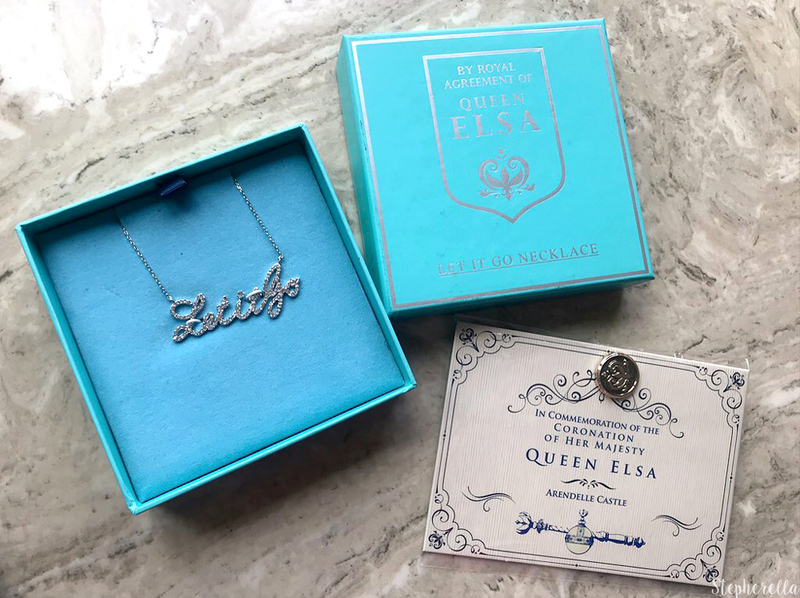 You are also handed a lovely pin of the Arendelle Crest and on the piece of card it comes with it says You are invited to Queen Elsa’s Coronation which, I found was a nice touch (the pin comes free!). They had lots of items available such as Olaf and Sven plushes, Elsa dolls, Elsa’s Coronation gloves which were so unique, also stunning jewellery including a Let It Go necklace which, is the item I purchased. It comes in a beautifully detailed box. 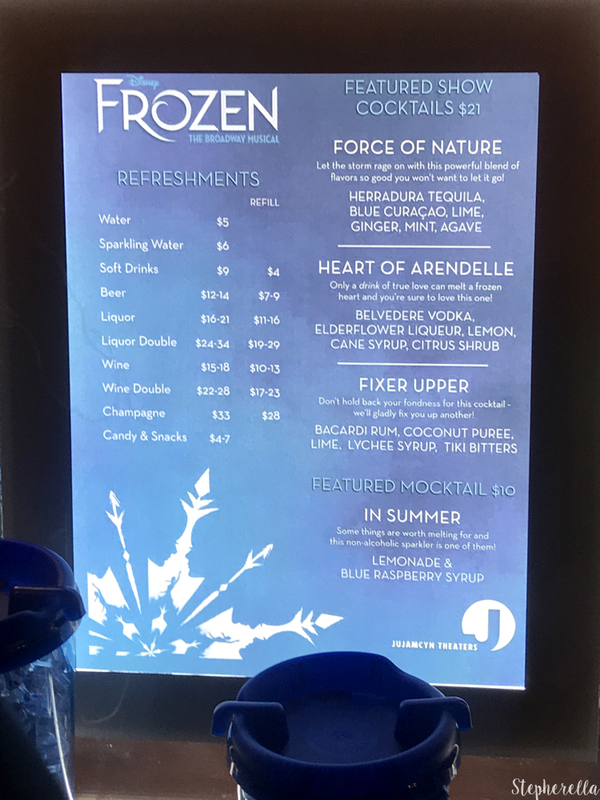 There are also Frozen themed Cocktails purchasable, with names such as Fixer Upper Cocktail and a Mocktail called In Summer. I tried the Fixer Upper Cocktail and it was delicious! It comes in a souvenir Frozen cup. 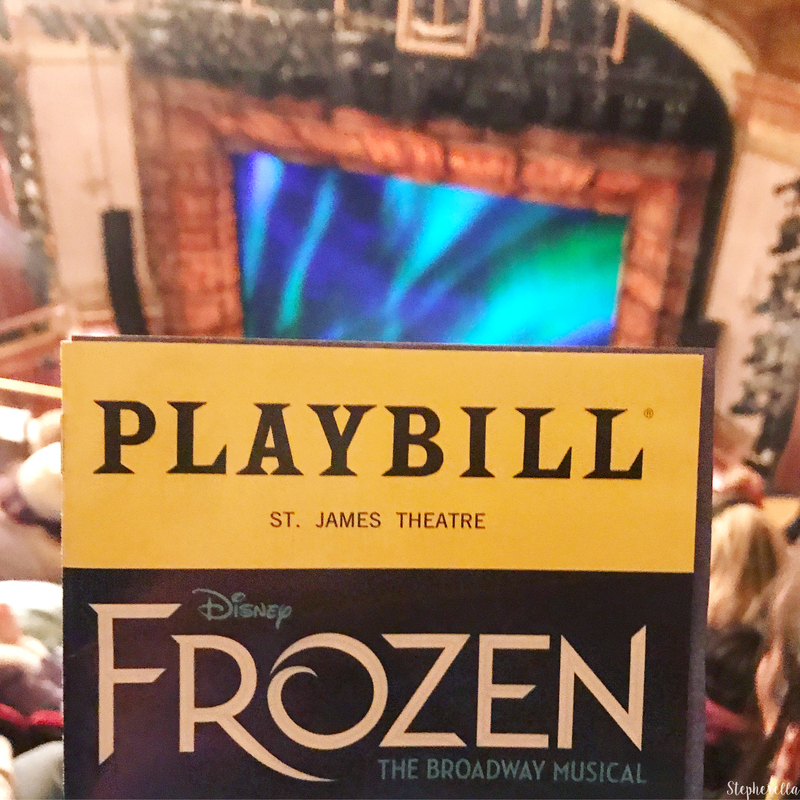 Frozen was my first ever Broadway show and if you ever go to New York, I highly recommend getting tickets to a show. Even better if you can get tickets to one thats not already in the West End as it makes it much more special. To get tickets, go to Ticketmaster.com. You don’t need to worry about the tickets arriving in the post, because you can use your phone and they will scan it at the door. You can also visit Times Square as they will have ticket places if you don’t want to purchase in advance. It’s also worth visiting the Theatres Box Office for last minute tickets. One thing Broadway offers that the West End doesn’t are Playbills, these are free at the Theatre. I have been dreaming of owning one of these since I was young, and for my first to be Frozen was very special. I’m so happy for you that your flights weren’t cancelled and you managed to make it to New York! I would absolutely love to see this show, The Lion King musical is definitely one of my favourites I’ve ever seen and I think it is such a good adaptation from the film that I’d love to see how they manage to adapt Frozen for the stage! I really hope this comes to London in the future so I get to see it! Your review was really good, glad you enjoyed it! If I ever manage to get to New York a Broadway show is top of the list!! The details are incredible and as I missed Frozen Live while in California Adventure park this would probably be the ultimate dream! Glad to see there is different frozen merchandise, no I’m still not sick of Frozen!! It is amazing and I hope you get to see it one day! I hope it comes to the West End very soon! 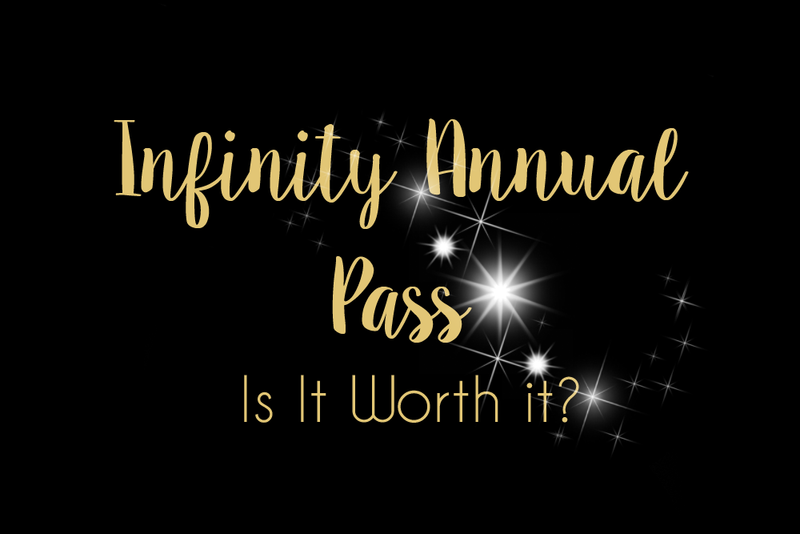 Do you get the invite to Elsa’s corniation when you’re in line or when you buy something? I saw online that there were two plush dolls of Anna and Elsa. We’re those still available or were they strictly a limited edition? 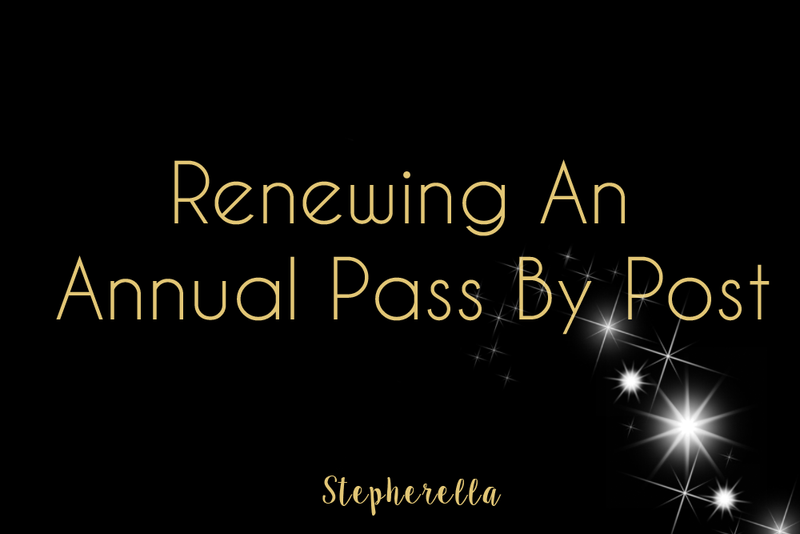 I’m planning on seeing Frozen for my big 30th birthday next month, and I’m so happy you enjoyed yourself! Question: do you know if they had the Anna and Elsa plush dolls available at the theatre? I saw them online, and they both look adorable! It would really be a shame to get to the theatre and find out they weren’t available anymore. Do you know if they were still there when you went to see the show? Happy 30th Birthday! What a special way to celebrate! I can’t remember seeing Anna and Elsa but I saw Kristoff and Sven. They also had an Elsa doll in a blue box. I saw it when it was in previews so I can’t tell I’m afraid. I do hope they are still there for you and I hope you have a wonderful time! I just wanted to let you know that when I went to see Frozen for my 30th birthday, they did have the plush dolls, and they were $30 a piece. I got Elsa for my first visit, and then on Wednesday when I went back to see Frozen again, I got Anna! 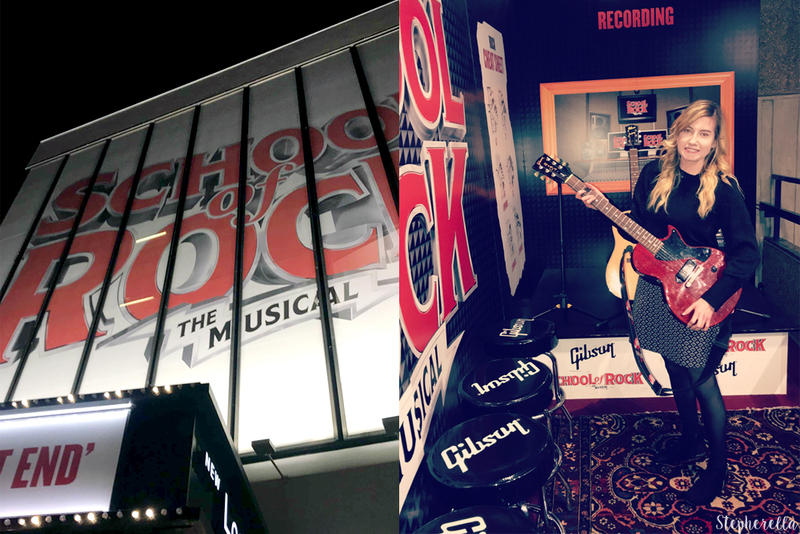 Thanks so much for your help, and I had a great time – both times I was there!